Though he says he tried and failed to be the class clown in high school, Milwaukee comedian Anton “Ton” Johnson eventually developed his material enough to give stand-up a belated try. 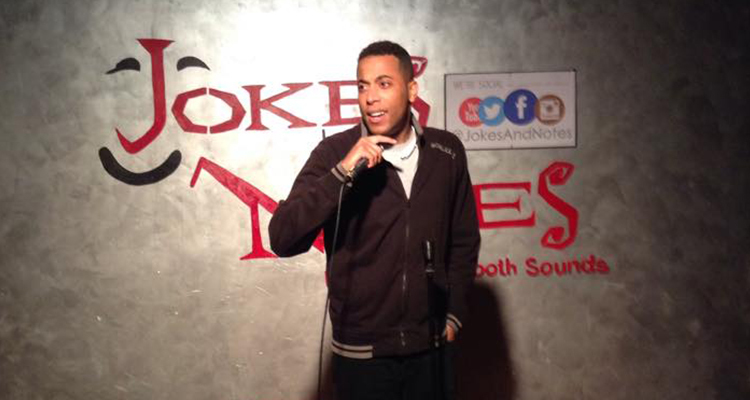 Since he made his open mic debut at Comedy Cafe (and won the contest) in April of last year, Johnson has never stopped telling his hilarious stories taken from everyday life in front of people. In fact, he can be counted among the few comics who bounces back and forth between they city’s divided comedy scenes. Before he takes the stage at Quarters on Sunday night, Johnson told Milwaukee Record about his stand-up start, the importance of performing in front of a variety of audiences, his goals for 2016, and why he credits his mother for his early success in comedy. Milwaukee Record: When did you start comedy? If memory serves, it was last spring. Ton Johnson: I started in the spring of 2014. The first show that I did was a Comedy Cafe open mic in April of 2014, and I was more nervous about that than anything else in my life, man, but it went really well. I won that one and then things just kept on getting better from there. More people started inviting me out. A couple comics reached out to me, telling me about mics, and it snowballed from there. Now I think I’m a regular. MR: What prompted you to start? Were you the funny guy at work or did you have enough of your friends say you should do stand-up that you finally bit the bullet and did it? TJ: It was actually the opposite. What really got me into it was so many people growing up telling me how unfunny I was. I tried to be the class clown in high school here and there, but everybody was always like, “You’re not funny, dude. Stop it,” but I kept trying. I went to college and I guess people got more receptive to it. People thought I was funnier then. As I graduated and started working at different jobs, co-workers were like, “You’re funny. You should try stand-up.” I never really pictured myself actually doing it. Then one day, I looked up open mics in Milwaukee and the Comedy Cafe is the first thing that came up. I went there and won it, and from there, I haven’t been able to stop. I got to tell jokes somewhere at least once or twice a week. MR: I know we’ve discussed this at length on the podcast, but the places you go up are all over the city. You do white—or alternative—rooms and so-called “urban” or black rooms. In terms of what you say on stage, are you trying to do universally accepted sort of stuff that can fit both rooms? Does the stuff you do at The Onyx go over as well as what you’re doing tonight [at Karma]? TJ: I tell the same jokes. I’ll do whatever set I was going to do that night, no matter where I’m going. Most of my material is just talking about things that I’ve experienced. I’m a storyteller. I laugh because I like to tell people I’ve never had an actual joke once. I tell stories, but I like to tell them from the perspective of what most people would think if that stuff happened to them. I’ll do my material the same way no matter where I am. MR: So as a storyteller, would you say most of your stuff is long-form? TJ: Most of my jokes are pretty long. I’m trying to get better at writing the clever one-liners and write quicker punchlines. I’ve done jokes and notes in Chicago and you get three minutes, and you get the [warning] light at two. When you’re first starting out, three minutes seems like a long time, but it’s really not that much time at all. That was one of the first times I had to hit them really fast. Since then, I try to get to my punchlines quicker. I don’t need five to 10 to 15 minutes to be funny. I’m taking some of the clutter out. MR: So you’re nearly two years in now. Are there any other goals you have in the near future? TJ: Absolutely. In 2016, I definitely want to have my own show, so to speak. I would like to rent out a place, have a couple comics open up for me, and then maybe do 40 minutes of material. I’ve headlined a couple of shows and I have a good feeling where my legs are at. I can go a lot longer than I could when I first started out. When I first started out, I could barely handle seven minutes, but I’ve been getting 25- to 35-minute guest spots lately, so I think I’m close to that point where I’m ready to have my own event. That’s something I’m really excited about. I want to take it as far as it can go. MR: I know I’ve already talked so, so much about it, but with you and Jason [Hillman] and a couple others among the few comics who kind of rove in between both of the comedy scenes, what do you think is holding it back? If you could distill it down to one bullet point, what do you feel is the major factor in the stand-up segregation in the city? TJ: Well, the segregation [in comedy] comes down to the segregation. That’s how Milwaukee is. There are guys I do mics with on the North Side who have never heard of any of the spots on the East Side. There’s guys I’ll do spots with on the East Side who have never heard of any of the neighborhoods on the North Side, and don’t even know that there’s comedy being done out there. A lot of people just don’t get out of their own area much and since people don’t intersect, you’re not going to catch a lot of collaboration between the two scenes. It can work, and you’ve got people who are really trying to put that together. The goal everybody has is to get better, and how much better are you going to get if you’re always performing for the exact same crowd? I’ll go anywhere. I’m comfortable anywhere. My mom is the one who gave me that ability to be comfortable. My mom raised me to be able to get along with and connect with anybody. She’s awesome. Ton Johnson will perform as part of the Cool & Tight comedy showcase/Planned Parenthood fundraiser at Quarters Rock ‘N Roll Palace on Sunday, November 8. The show begins at 7:30 p.m. and costs $5 (which goes to Planned Parenthood).